Tardigrade (microscopic animal) is able to withstand temp. close to absolute zero and survive in open space for at least 10 days. In September 2007, satellite FOTON-M3 was successfully sent into orbit, and the Biopan-6 platform was opened, exposing tardigrades of the TARDIS experiment to open space. After being rehydrated back on Earth, over 68% of the subjects protected from high-energy UV radiation survived and many of these laid eggs that hatched normally, and a handful survived full exposure to solar radiation. This makes them the only known animal that can survive the extreme environment of outer space for 10 days. Tardigrades are microscopic, water-dwelling, segmented animals with eight legs. Adults may reach a body length of 1.5 mm, the smallest are below 0.1 mm. They are more commonly known as water bears or moss piglets, because of the their gait that resembles that of a bear. They occur over the entire world, from the high Himalayas (above 6,000 m), to the deep sea (below 4,000 m) and from the polar regions to the equator. The most convenient place to find them is on lichens and mosses. Temperature – tardigrades can survive being heated for a few minutes to 151oC (424 K), or being chilled for days at -200oC (73 K), or for a few minutes at -272oC (~1 degree above absolute zero). Pressure – they can withstand the extremely low pressure of a vacuum and also very high pressures, more than 1,200 times atmospheric pressure. Recent research has revealed that they can also withstand pressure of 6,000 atmospheres, which is nearly six times the pressure of water in the deepest ocean trench. Dehydration – tardigrades have been shown to survive nearly 10 years in a dry state. When encountered by extremely low temperatures, their body composition goes from 85% water to only 3%. As water expands upon freezing, dehydration ensures the tardigrades do not get ripped apart by the freezing ice (as waterless tissues cannot freeze). 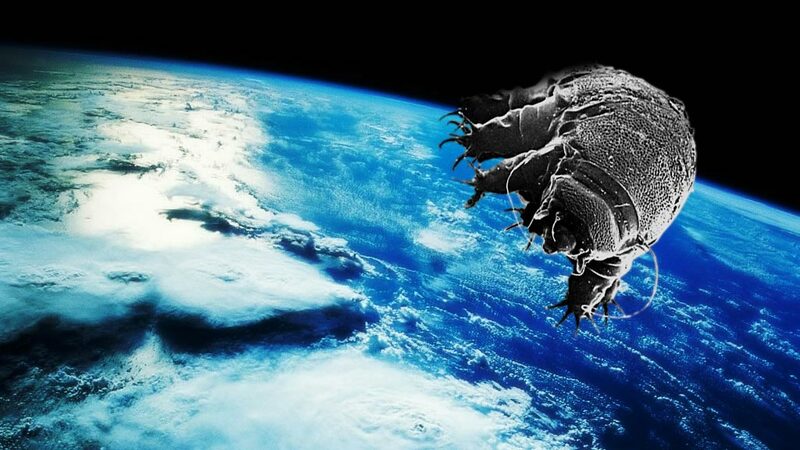 Radiation – tardigrades can withstand median lethal doses of 5,000 Gy (gamma-rays) and 6,200 Gy (heavy ions) in hydrated animals (5 to 10 Gy could be fatal to a human). The only explanation thus far for this ability is that their lowered water state provides fewer reactants for the ionizing radiation.